Although she’d been writing, on and off, for most of her life, it wasn’t until Cynthia Claus had published her first book, An Orchid Sari, two years ago, and held it in her hands, that she felt she had the right to call herself a writer. 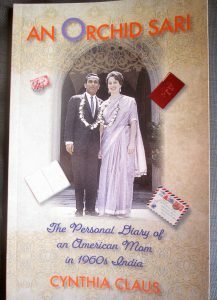 This slim volume, with its enticing cover of the young Cynthia dressed in a stunning, pale-lavender sari and standing beside her handsome Indian husband in front of an ornate doorway, is a compilation of diary excerpts and aerogram letters home to her American parents in 1968, when she, her husband, and their toddler son spent two months visiting her husband’s homeland. Cynthia’s second book, Ice Cream & Pretzels, which she published last summer, is a collection of personal essays she’d written over the years recounting her home life growing up in an affluent section of Philadelphia, the eldest of three daughters born to physician parents. In it, Cynthia “tells it like it was,” both the good and the bad, with the understanding and compassion that only comes with age. Two more books are in the works, Cynthia told me when we met at her lovely apartment here in San Miguel de Allende, Mexico, recently. Like many of the women retirees I’ve met in San Miguel, Cynthia has seen her creative side blossom since she planted herself here seven years ago. 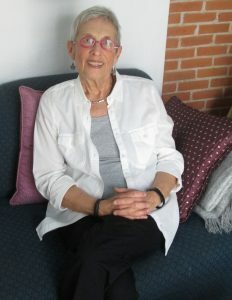 Her third book, to be published this summer, chronicles her world travels before deciding to settle in San Miguel de Allende; and the subsequent book, her fourth (to be published in 2020), will continue with her travels and adventures after she’d made San Miguel her new home base. Apart from the pride she takes in her family — two adult children, their spouses, plus two teenage grandchildren — and the pleasure she derives from her writing, Cynthia considers her move to San Miguel to be among her greatest accomplishments. One of the deciding factors for Cynthia in choosing to settle in San Miguel in 2012 was learning that there is a large, vibrant, English-speaking U.U. (Unitarian Universalist) congregation here. As a third-generation U.U. from Philadelphia, Cynthia naturally gravitated to this U.U. Fellowship, and she has felt embraced by it. She especially appreciates this congregation’s dedication to supporting the Mexican community by designating at least 50 percent of its annual budget to social action grants.